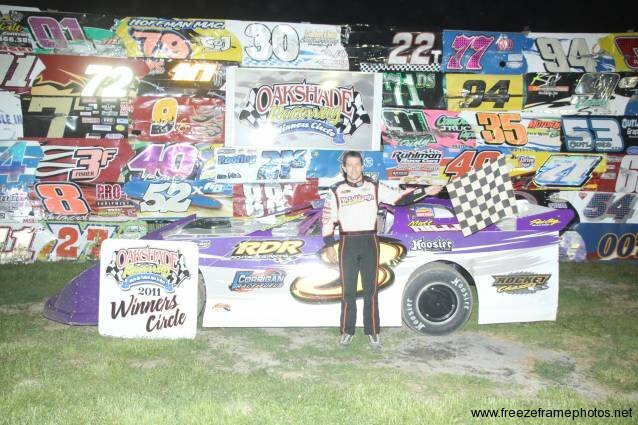 Race fans were treated to exciting racing action on the season opening Saturday night at Oakshade Raceway, highlighted by Matt Miller’s UMP Late Model feature win. Defending UMP Late Model Track Champion Rusty Schlenk took the lead at the start of the 25-lap feature after starting on the pole. As Schlenk began to open an early lead over fellow Weston, Ohio driver Josh Scott, Matt Miller was muscling his way toward the front in the Rick Delong Racing number three. Miller worked his way up to second by lap nine and one lap later, Josh Scott and Kevin Reeve fell off the pace and retired to the pits giving up top five runs for both drivers. The first caution flag flew on lap 11 after Zac Davis spun. Miller then snatched the lead away from Schlenk on the ensuing restart and never looked back. The 1991 track champion went on to win the first UMP Late Model feature of the year. Andrew Reaume from Blenheim, Ontario Canada had a great run to finish second after starting inside row four. Casey Noonan got by Schlenk to finish third just before the finish with Steve Kester ending up just behind in fifth. 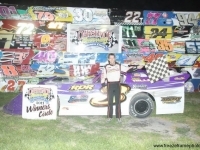 Tim Line won the UMP Sportsman championship at Oakshade Raceway last year and picked up right where he left off with a clean sweep on Saturday night, winning both his heat and the feature event. It was Tim Fisher who led at the start of the feature, but it only took Line three laps to take the race lead after starting on the outside of row three. Line was the class of the field in a caution-filled UMP Sportsman feature. Despite the field being kept tight with the multiple caution periods, Line managed to open up a lead after each restart on his way to capture the checkered flag. Bob Gregory had a solid run that ended in a second place finish followed by Bruce Stuart and Joe Smith who started way back in 16th. Tim Fisher recovered from a spin just after halfway to salvage a fifth place finish. Jeff Geis stacked up the field in the UMP Bomber A Main when he spun in the first turn just after the drop of the green flag. Tony Tolles took advantage of starting on the pole to lead early on. Holland, Ohio’s Jeff Foks charged quickly up through the field and took the lead from Tolles just before a hard crash that involved Satch Crispen, Teri-Lynn Murphy and Dan Shaffer leaving Crispen’s car destroyed after also getting caught up in the first caution with Jeff Geis. Foks continued to lead and managed to fend off a late race challenge from Craig Dippman who started deep in the field. Dippman dove to the inside of Foks in the final set of corners, but came up short as Foks was first to the checkered flag. Dippman settled for second followed by Terry Rushlow, Curt Lancaster and Danny Hogrefe. Kevin Murday got bounced around and finally spun out on the first lap of the Hornet feature event resulting in a complete restart. “Sparky Marky” Gillingham opened up an insurmountable lead after the complete restart to win his second feature in a row after picking up his very first feature win in the final race last season. Drew Smith worked his way up to finish second with Josh Froelich third. Brandon Myers and Logan Hough rounded out the rest of the top five finishers. Gregg Detray looked to have a strong run in the UMP Bomber B Main, but quickly fell off the pace after leading the first lap. That turned the race lead over to Jake Gamber. Gamber led until a caution flag on lap five slowed the field. Under the caution period, Gamber’s left rear tire went flat, but he stayed on the track and took the green field at the front of the field. Jon Miller took the lead on the restart as Gamber dropped back through the field and eventually pitted. Miller held off Kyle Light to pick up the UMP Bomber B Main victory. Terry Rump took third after starting 10th and Amy Bernard finished fourth after starting even deeper in 14th. Zach Tipton was fifth. Shaun Sharp made a three-wide pass on the outside of Mike Draper and Richard Riffe to take the early lead in the UMP Bomber C Main. Sharp held the lead until Randy Murday from Adrian, Michigan took command on lap seven. Murday led the rest of the way with Sharp settling for a second place finish. Dean Taylor, Richard Riffe and Mike Draper were the rest of the top five finishers. The final event of the night was the debut of the UMP Sport Compact class which started the night with four cars checked in. Two of those cars were unable to make the start of the inaugural feature event leaving only two drivers to battle for that first ever UMP Sport Compact feature win at Oakshade. That honor went to two-time Hornet champion Derek Morris. Stephanie Miller earned a second-place finish. Another big weekend of racing is on tap at Oakshade Raceway with a full show of UMP Late Models, UMP Sportsmen, UMP Bombers, Hornets and UMP Sport Compacts on Saturday night. Gates open at 4pm with racing at 7pm. Then on Sunday afternoon, Oakshade will host its second Two-hour/200 lap Enduro race of the year paying $1,000 to the winner. General admission to this event is just $3. Gates open at noon with the race at 2pm.